It’s been 15 years since Steve Perry parted ways with Journey, but his shadow remains a constant for the band who achieved their greatest commercial success with the singer. In a new interview with Noise 11, Journey guitarist spoke about Perry, who he hasn’t seen in almost a decade. "You know what? I say nice things about him, and he says nice things about me," Schon tells Noise 11. "I think, all in all, I have ultimate respect for the man, and the voice that he has. I wish him the best, but we haven't quite gotten around to speaking since we received the Hollywood Walk Of Fame star [in 2005]." Schon explained some of the background of Perry’s arrival in the band. 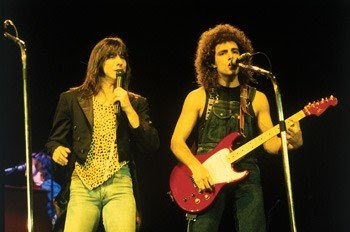 A tape featuring Perry made its way into the hands of Journey manager Herbie Herbert, but the guitarist wasn’t sold at first.